So much of life is delicious, pure, sweet tasting lemonade. And then there are times when all you get are stinky, rotten lemons. It's what you do with the stinky lemons that defines your character. Right? You are going along, enjoying your running life - beautiful long runs, short fast runs, races, or not racing at all. So, you can cry in your soup, eat lots of cake and get out of shape. you can find other ways to stay fit, heal your injury and when you go back to running - its not so bad after all. Head down to the local pool, or your backyard if you are lucky enough to have your own! You can still stay fit without the impact of running. 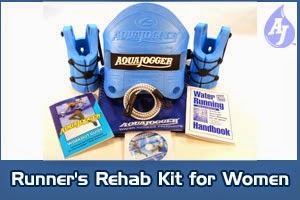 Aqua Jogger is a product that will allow you to stay in shape with its water running program. Also, check out this article from Runner's World giving you other great options for effective cross training during an injury. When injury takes you off the roads, what do you do to stay in running shape? NOTE: These are my own opinions. I have not been compensated in any way for this post. Labels: cross training, injuries, Nats-Runbits, pool running.